NIA CHARLESTOWN NEVIS (JULY 14, 2015) — Veteran Educator on Nevis Marion Lescott, said her farewell to teaching at the island’s schools. 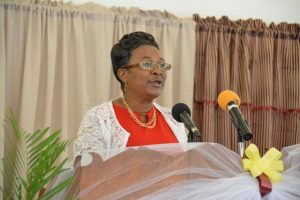 She thanked the Nevis Island Administration (NIA) for the opportunity to serve as teacher for 23 years and as head teacher for 18 years at the government owned schools. Lescott, was at the time delivering her school’s progress report at the at the recent graduation ceremony of the Elizabeth Pemberton Primary School (EPPS) where she served her final year as head teacher. The ceremony was held at the United Pentecostal Church, Marion Heights. As she reflected on her career, she said she was doing so with a sense of pride and satisfaction, knowing that she had done her best and had touched the lives of many in positive ways.